Our president just provided us with a new precedent. America negotiates with terrorists. Although it has been our policy not to do so for clear and obvious reasons, Obama has set a new standard for establishing the most dangerous foreign policy deviation in American history. I am sorry, but the life of one man is not worth the lives of millions. Yes, I’m certain I would feel differently if it were my own son, but I would still not expect such a treacherous negotiation against the American people, and neither would he. 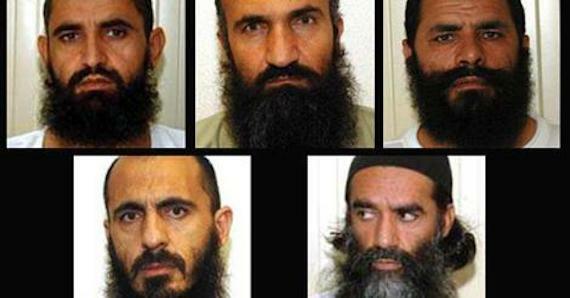 President Obama traded the Taliban Five also known as the Taliban Dream Team, the most dangerous and highly influential Taliban/Al Qaeda leaders to ever darken the planet, for a man who may in fact have defected to the Taliban five years ago rather than having been abducted as originally believed. Did you have a say in this? Did I? Is it appropriate for us to release such crimes-against-humanity criminals to mainstream society after they have vowed annihilation to the United States? On Tuesday, Obama admitted to The Associated Press that the release of the prisoners could present a threat to American Citizens, but he did it anyway. The Taliban leaders have already moved into a residential compound in the capital, Doha, and could “move around freely” within the nation. The source said the terrorists will not be treated like prisoners and U.S. officials will not be allowed to monitor them. This is in direct contradiction to what Obama has told us. He stated in several news conferences that we would be “keeping eyes on them.” As it turns out, it’s just another smoke screen to hide the truth. In the past, it was necessary for any U.S. President to contact Congress thirty days in advance prior to enacting such a blatantly dangerous maneuver, but last year Mr. Obama felt that such notifications should be declared unconstitutional since they interfered with his power. Subsequently he signed a document declaring such notifications unnecessary and unconstitutional so that he could do as he pleased. The very reason the law was put into place was to protect America from a power-wielding, uncontrolled president accountable to no one. There was no debate. No consensus. He simply signed a new declaration quietly making him the first American dictator in history. Under Mr. Obama’s direction, we are strategically placing the most dangerous Al Qaeda forces in place to wreak havoc upon our nation, and there is nothing we can do about it. This is no longer a democracy—there is no longer control, there is no longer accountability. We have never had a more dangerous, reckless president, nor one so intent on carrying out his own agenda regardless of Congress and the American people. We have few enemies who pose as high a risk to our national security as our own commander-in-chief. We had better learn to bow or die—those will soon be our only options. I’m not bowing.